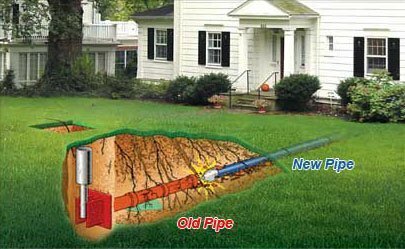 Ho-Ho-Kus NJ - Are Tree Roots Damaging Your Sewer Main? New Jersey is a naturally forested environment, and many homes in Ho-Ho-Kus have large, old growth trees on their properties. The trunk, branches, and leaves of a tree are just one small part of the entire organism. Hidden beneath the soil is a vast network of large, strong roots that can spread out surprisingly far. 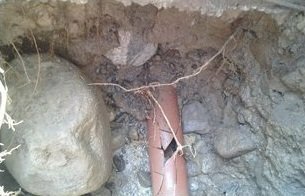 It’s not uncommon for tree roots to start growing around your sewer main line. The pipes, usually made from PVC by manufacturers provide a good stabilizing anchor that roots love to grow around. Over time, however, the roots can end up causing serious damage to the pipes. 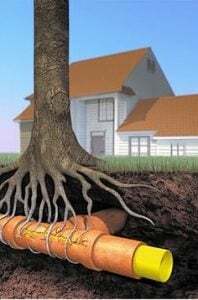 Especially with older pipes, which are made of less durable materials, small feeder roots from the trees can begin to make their way inside through cracks, looking for the nutrients contained inside. Root growth is actually one of the leading causes of sewer main clogs and backups, which are big, nasty, and potentially expensive plumbing problems to deal with. If you suspect that tree roots might be the source of your sewer problems, give us a call today at A1 Sewer and Drain for fast, professional sewer repair in Ho-Ho-Kus. Tree roots will naturally grow in certain ways, and there’s sometimes little that can be done. However, there are a few steps that homeowners can take to minimize the likelihood of sewer main damage from root growth. 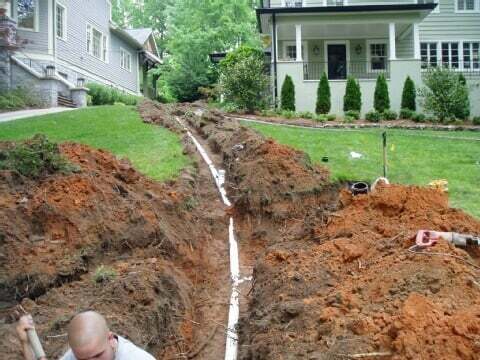 Figure out where your sewer lines are located. When you’re landscaping your yard, it’s helpful to know where your sewer main is actually located, so that you can prevent planting new trees nearby. Install barriers between plant growth and the sewer line. On residential properties, it’s common to use special chemicals, like copper sulfate and potassium hydroxide, to discourage root growth in certain areas. These substances are designed to release slowly, and they impede the ability of roots to grow. Some people also install a physical barrier made from wood or metal, located underneath the ground to block tree roots from accessing the sewer main. Choose sewer-friendly landscaping plants. If you’re going to plant a larger tree, it’s best to do so away from the sewer main. Smaller shrubs and flowering plants have smaller, softer roots that won’t damage your sewer, making them a better choice for areas above and around the pipes. Keep an eye out for frequent sewer clogs. If your sewer is clogging or backing up frequently, the problem could be root growth. Have roots near the sewer main removed. Problematic root growth can be safely cut away from your sewer line and the surrounding areas, without hurting the tree as a whole. 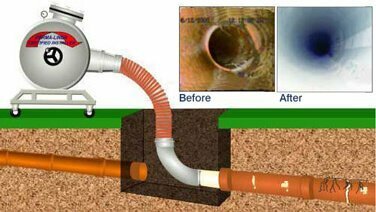 If your sewer is backed up, and tree roots are the problem, a professional NJ sewer repair company can unclog the pipes and remove the offending root growth. Heavy duty augurs and high pressure water jets are strong enough to eliminate many of the encroaching roots. To find out whether tree growth is the problem, professionals use sophisticated fiber optic camera systems mounted on flexible augurs. This allows them to look up close at what’s going on inside the pipes. If your sewer is clogged or backed up, tree roots sewer line growth might be the problem. For NJ Plumbing Service give us a call today at 201-645-0888. We’re available any time, even nights and weekends, with no additional charge for service outside of regular office hours. Our certified technicians can take care of your root growth problem, keeping things in your sewer flowing smoothly.